Welcome to the Evidence Based Birth® Q & A Video on Taking Castor Oil to Start Labor! Azhari, S., Pirdadeh, S., Lotfalizadeh, M., & Shakeri, M. T. (2006). Evaluation of the effect of castor oil on initiating labor in term pregnancy. Saudi Med J, 27(7), 1011-1014. Boel, M. E., Lee, S. J., Rijken, M. J., Paw, M. K., Pimanpanarak, M., Tan, S. O., . . . McGready, R. (2009). Castor oil for induction of labour: not harmful, not helpful. Aust N Z J Obstet Gynaecol, 49(5), 499-503. Boltman-Binkowski, H. (2016). A systematic review: Are herbal and homeopathic remedies used during pregnancy safe? Curationis, 39(1), 1514. El Mauhoub, M., Khalifa, M. M., Jaswal, O. B., & Garrah, M. S. (1983). “Ricin syndrome”. A possible new teratogenic syndrome associated with ingestion of castor oil seed in early pregnancy: a case report. Ann Trop Paediatr, 3(2), 57-61. Garry, D., Figueroa, R., Guillaume, J., & Cucco, V. (2000). Use of castor oil in pregnancies at term. Altern Ther Health Med, 6(1), 77-79. Gilad, Ronnie, Hohner, Haiti, Vinograd, Orit, . . . Shay. (2012). 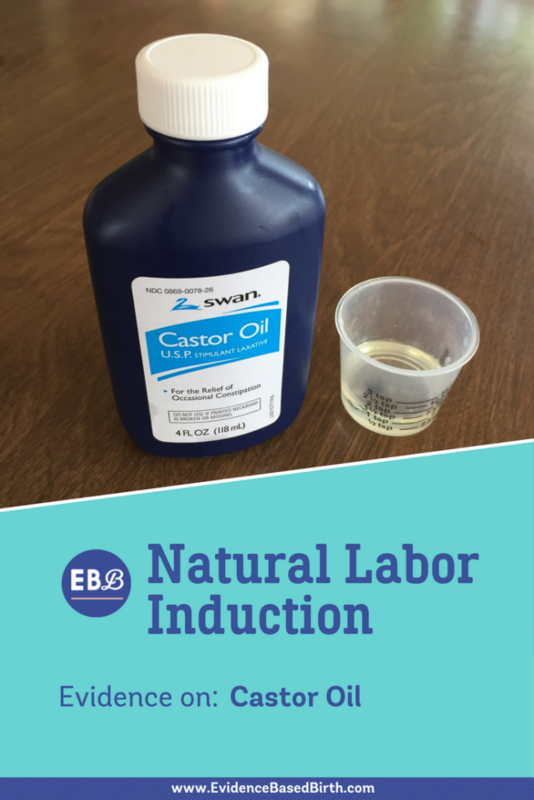 The CIC Trial–castor oil for induction of contractions in post-term pregnancies. American Journal of Obstetrics and Gynecology, 206(1), S77-S78. Kelly, A. J., Kavanagh, J., & Thomas, J. (2013). Castor oil, bath and/or enema for cervical priming and induction of labour. Cochrane Database Syst Rev(7), CD003099. Mozurkewich, E. L., Chilimigras, J. L., Berman, D. R., Perni, U. C., Romero, V. C., King, V. J., & Keeton, K. L. (2011). Methods of induction of labour: a systematic review. BMC Pregnancy Childbirth, 11, 84. O’Sullivan, M. D., Hehir, M. P., O’Brien, Y. M., & Morrison, J. J. (2010). 17 alpha-hydroxyprogesterone caproate vehicle, castor oil, enhances the contractile effect of oxytocin in human myometrium in pregnancy. Am J Obstet Gynecol, 202(5), 453.e451-454. Patel, V. R., Dumancas, G. G., Kasi Viswanath, L. C., Maples, R., & Subong, B. J. (2016). Castor Oil: Properties, Uses, and Optimization of Processing Parameters in Commercial Production. Lipid Insights, 9, 1-12. .
Salami, S. A., & Raji, Y. (2015). Generational reproductive outcomes in Wistar rats maternally exposed to Ricinus communis oil at different stages of gestation. J Dev Orig Health Dis, 6(5), 443-453. Steingrub, J. S., Lopez, T., Teres, D., & Steingart, R. (1988). 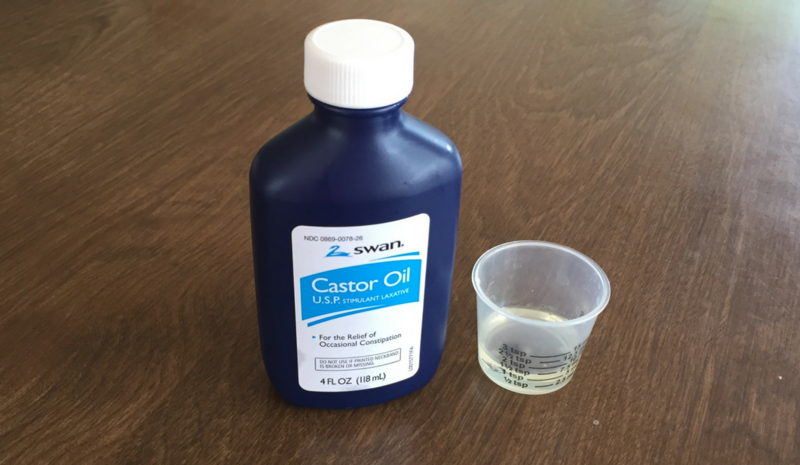 Amniotic fluid embolism associated with castor oil ingestion. Crit Care Med, 16(6), 642-643. Tunaru, S., Althoff, T. F., Nüsing, R. M., Diener, M., & Offermanns, S. (2012). Castor oil induces laxation and uterus contraction via ricinoleic acid activating prostaglandin EP3 receptors. Proc Natl Acad Sci U S A, 109(23), 9179-9184. Hi everyone. My name’s Rebecca Dekker and I’m a nurse with my PhD, and the founder of Evidence Based Birth®. In today’s video, we’re going to talk about using castor oil to induce labor. So in today’s video, we’re going to talk about using castor oil to induce labor. Castor oil is also known as Oleum Palmae Christi, and it comes from the seeds of the Ricinus communis plant. Castor oil is a really powerful laxative. It’s often administered by mouth to rats to induce diarrhea in order to study the anti-diarrheal effects of a potential drug. So they’ll give the rats diarrhea with castor oil and then try to give them other drugs to stop the diarrhea. In 2013, a Cochrane Review looked at the evidence of castor oil for induction of labor in women who are pregnant at term. They state that herbal remedies have been used during pregnancy and childbirth for many centuries, and most of the evidence on these herbal remedies is anecdotal or passed down in oral tradition to younger generations. Reports dating back to ancient Egypt have suggested the use of castor oil to stimulate labor. The review included three trials that studied a total of 223 pregnant women at term who received a single 60ml oral dose of castor oil. One of these randomized control trials took place in New York and included 100 pregnant people total. Women who took castor oil had a significantly increased chance of starting labor in 24 hours compared to the group that received no treatment. In fact, about 58% of women who took castor oil began active labor within 24 hours compared to only 4% of those who did not receive any treatment. However, 100% of women who took the castor oil reported nausea compared to 0% of the women in the control group. There was another smaller randomized trial in Iran that included 43 pregnant women total. They found a significant increase in labor starting during the first 24 hours for women who took castor oil. 54% of women who took castor oil started labor within one day compared to 4% in the other group. Also, the mean Bishop score, which we use to measure cervical ripening also increased in the castor oil group. Finally, the third study in the Cochrane Review was a randomized control trial in Israel that included 80 pregnant women total, and the odds of entering active labor within 12 hours was three times higher in the castor oil group, and there were no differences between the groups with regard to C-section rate, meconium-stained fluid, Apgar scores, or instrumental deliveries. They concluded that castor oil is safe and effective for induction of labor in post-date pregnancies. So the Cochrane Reviewers concluded that there’s no evidence of any difference between C-section rates between castor oil, people who take nothing, or placebo. However, pretty much every woman who ingested the castor oil felt nauseous afterwards. They also concluded that because these three studies were so small, we really need more data and more people in studies before we can draw conclusions about effectiveness and side effects. There have been several animal or rat studies on using castor oil during pregnancy or just in general, how does it work? There was one really technical paper that set out to identify how castor oil works, and they found that there is an active component of castor oil called Ricinoleic acid that activates prostaglandin receptors, and they found that this induces contractions in both the intestines and the uterine muscles of the rats that they were studying. There was also a study where they took strips of pregnant uterine tissue from humans and they looked at the effects of when they exposed that tissue to castor oil, and they found that those strips of uterine tissue were much more likely to have contractile activity or have contractions. There was one case report way back from 1988 that reported an amniotic fluid embolism and a woman who had ingested castor oil during pregnancy, but a cause-effect relationship could not be established. There is other evidence from animal studies and case reports that castor oil can be quite dangerous if taken in early pregnancy for the fetus. However, when researchers have looked at using castor oil at the end of pregnancy at term to induce labor, studies have found that it is effective at inducing labor. However, it’s difficult for us to draw conclusions about the effectiveness and safety of taking castor oil at term to induce labor because very few studies have been done. There is strong evidence, though, that it causes nausea in whoever takes it. I’ve never taken it myself, so I don’t know exactly what it tastes like, but it smells kind of like a mixture of rubber and paint, so I think it would probably not be pleasant to date, but it sounds like some studies have found that it works, so hopefully we can get more research on castor oil. In the meantime, I hope you found this video on the evidence helpful.